Even in her time away from the Smithsonian, this Lead Facilitator is a master maker. From the warm, sunny beaches of Puerto Rico comes the subject of our Staff Spotlight’s next exciting feature. 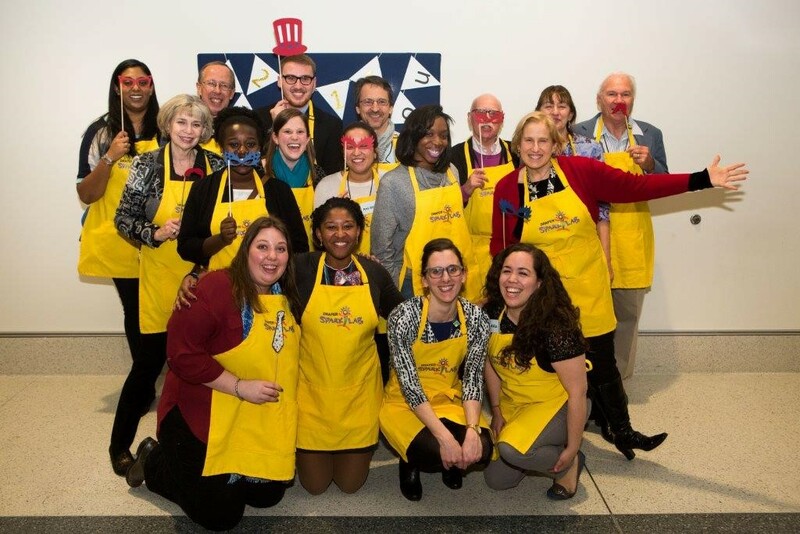 Natalia Febo serves as a Lead Facilitator of Draper Spark!Lab, located at the National Museum of American History. In addition to guiding museum visitors as they invent and innovate, she conducts extensive evaluations of the Spark!Lab space, analyzes data, researches ways to improve everyday operations, and performs various other duties to help the exhibition run. Natalia helps kids in other ways, too. When she’s not pursuing her hobbies or making family visits to a faraway island, she works as a Maker Educator at KID Museum. If you catch her in Spark!Lab, you can ask her about this unique, STEM-focused makerspace in Bethesda, MD. Natalia graciously sat down to respond to some interview questions. What’s your job title? What are your responsibilities? I’m one of the Lead Facilitators, and I work with the other Facilitators and Managers in making Spark!Lab a fun, hands-on, inventive space for kids. What background do you have in working with children? I have been working with museum-education programs for almost 10 years. It all started while I was in undergrad, and I began working in the education department of the Museum of the University of Puerto Rico. I offered guided tours of the exhibits to schools and also assisted the art instructors during the art workshops offered on weekends. 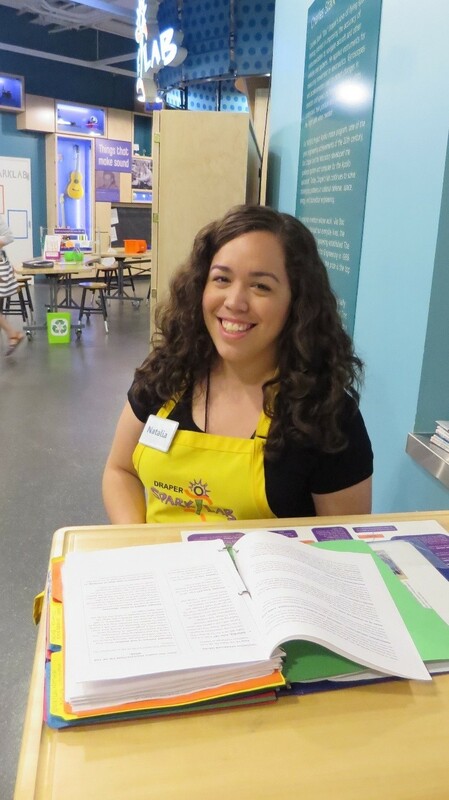 I’m a Maker Educator at KID Museum, a space that offers interactive experiences for elementary- and middle-school-aged children that integrate hands-on science, technology, engineering, art and math learning with an exploration of world cultures and global citizenship. I currently work the after-school programs and go to schools in Maryland to do STEM-focused projects. During the past few months, I led a program in which middle schoolers made a boom box with all of its components! What’s your least favorite thing about Spark!Lab? Although the Hub is another of my favorite areas of Spark!Lab, during periods of high visitorship, sometimes it can get very messy. It’s just a matter of telling the inventors at work to clean up the tables for the next inventors. Natalia oversees inventing in Spark!Lab's Hub area on opening day. If you had to explain Spark!Lab in four words, which would you select? When you’re not working at the Museum, what do you do in your free time? I recently took a cake-decorating class, and I loved it! In my free time, I’m practicing those new cake-decorating skills. 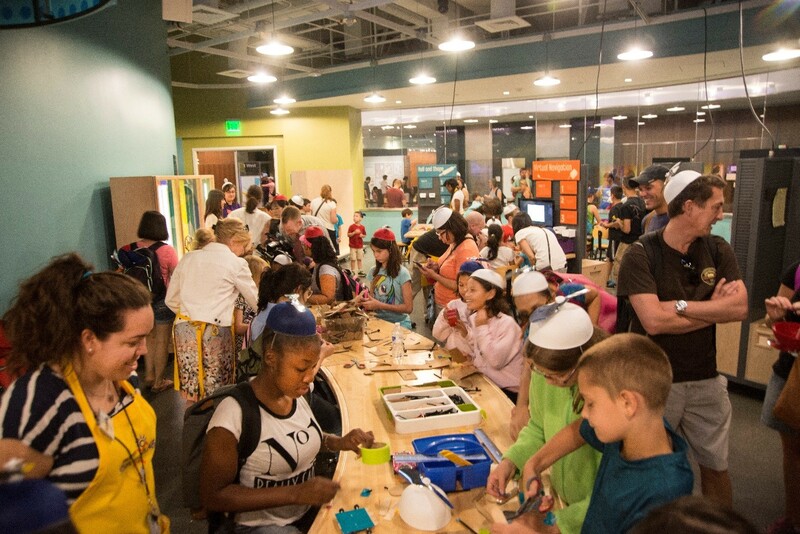 What’s your favorite invention created by a visitor in Spark!Lab? A teenager sketched an invention of a camera for babies with shapes they could push to do the different camera tasks. Her design was very elaborate, and I think there is potential to market it! I have always been into photography and cameras. I got my first camera when I was in first grade and was always the child taking photos of everything. What about your favorite object at NMAH? Natalia (bottom row, far right) always brings a smile to Spark!Lab and its many hardworking volunteers. What is your favorite invention in the entire world? It’s actually kind of new and still in the pilot phase. It’s called the Ocean Clean Up Array, and it was developed by a young Dutch inventor, Boyan Slat. The project envisions a network of long, floating barriers that would allow the ocean currents to gather plastic passively. Once the plastic is concentrated at a central point, it can be collected for recycling. If the project goes through, cleanup will be scheduled to start in 2020 and could be the largest ocean cleanup in history. I’m an islander, so going to the beach, being surrounded by water, and doing water-related activities has been part of my whole life. Clean water is essential for everything, and I think this project has a lot of potential. How does the proximity of Wegman’s Wonderplace affect Spark!Lab? Wonderplace is a great area for younger kids. It does occasionally attract the younger kids to Spark!Lab, but those are our future inventors. A small modification in our interactions with those kids helps them have a great time. Do you consider yourself inventive or innovative? Yes, very innovative. Working in spaces like Spark!Lab, we need to be very inventive and innovative to come up with quick solutions to problems that happen unexpectedly.